Carrier Grade NAT, also known as Large Scale NAT (LSN), helps with IPv4 resource conservation by sharing an outside IP address among multiple inside, local (private) IP addresses. 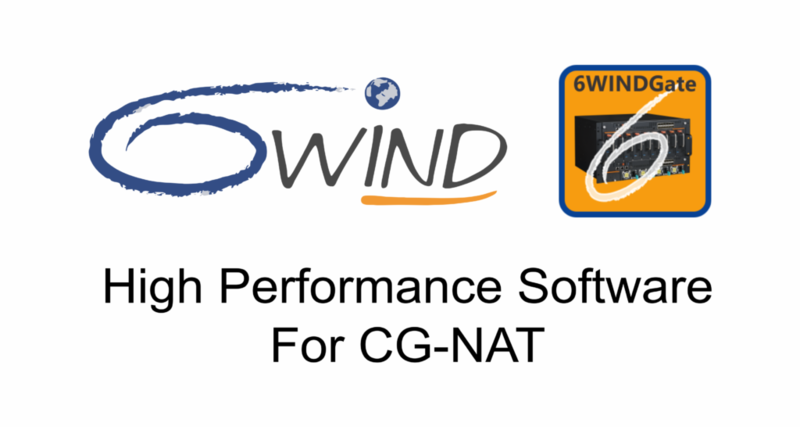 6WIND provides a high performance software alternative to hardware-based CG-NAT solutions for OEMs and Network Operators who are looking to increase flexibility and lower costs while accelerating time-to-market. 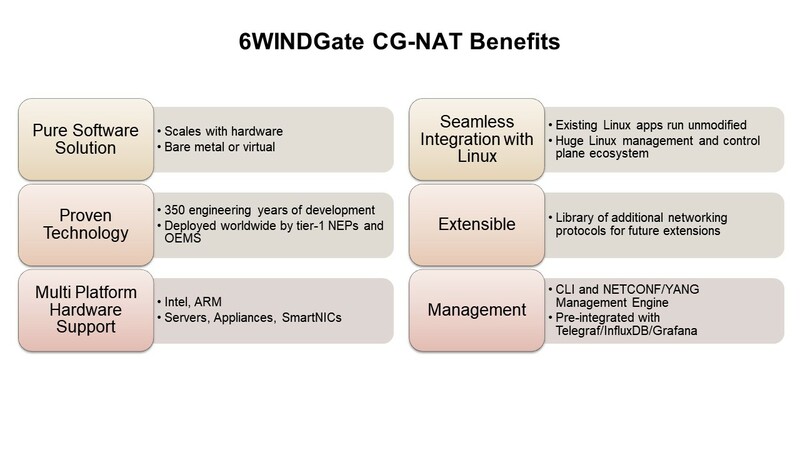 Tier 1 OEMS have designed NAT, and now CG-NAT, solutions with 6WINDGate source code for over a decade leveraging 6WIND’s high performance software on commercial-off-the-shelf (COTS) servers as an alternative to expensive hardware. 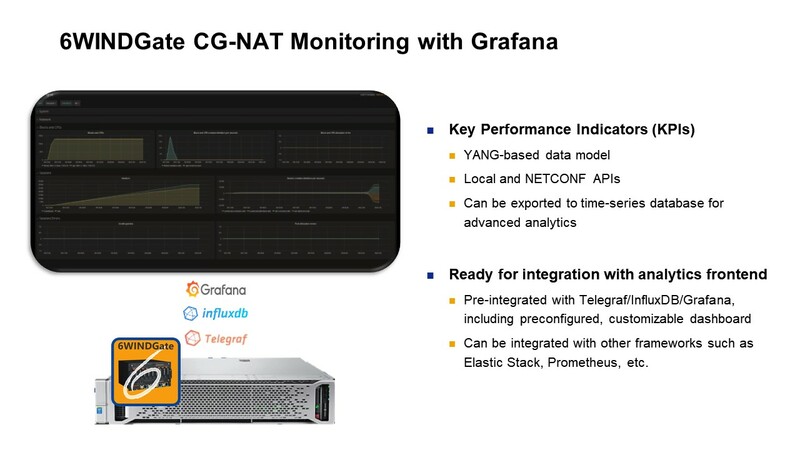 6WINDGate includes a complete set of CG-NAT features within its comprehensive Layer 2-4 networking stacks, to meet your design requirements. 6WINDGate software scales linearly with the numbers of cores. 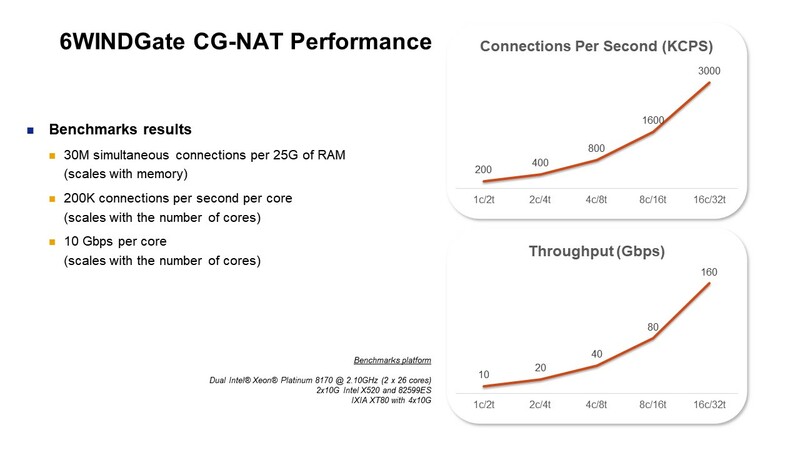 If you need more performance, simply add more cores to the configuration. 6WIND provides both traditional, CLI-based management and management based on YANG, and NETCONF APIs for integration with higher level orchestrators and management frameworks. We provide packaged images for bare metal, KVM, VMware and AWS and leverage the Linux cloud-init and Ansible features to enable customization of the system. 6WIND supports the traditional SNMP and syslog mechanisms, plus data plane telemetry through sFlow, and graphical analytics with time series data base Read our blog on 6WIND’s software management here.